Sweden, the country that takes international prestige by bestowing the Nobel Prize in a variety of subjects – including Medicine, Economy and Literature – is now told about being a nation of striking low school performance in mathematics, science and reading. According to the international rankings in “PISA 2013 Results”, Sweden scored lower than the average of both OECD country-members (n= 34) and among the accumulative list that also includes 31 OECD country-partners (Total N= 65). However, my analysis of the new published statistics by the Programme for International Student Assessment (PISA), indicates that Swedish students score quite high – way above the average of OECD countries – in the percentage of students agreeing with the statement “I feel happy at school”. And I believe that this could be a better indicator of mental health, scholar system’s efficacy aside. Other, very important aspects, which regrettably are not commented in the context of the PISA 2013 report, is that Sweden has a higher-of-average education-level among the population, and has a high prevalence of students attending the school system regardless social or ethnic issues. Further, however “Reading performance” for Swedish students is reported being lower than OECD average, at the same time the English-language skills among Swedish students is reputed being the highest in the world for non-native English speakers [See ranking at English Proficiency Index]. Referring to percentage of students who agreed or strongly agreed with the statement “I feel happy at school”, Sweden positions together with Chile in number 10 among the 34 OECD countries. In the scale ranging 1 to 100, being the OECD average 80 per cent, Chile and Sweden shared an approximate 85 per cent score. Fig 1 shows both OECD and OECD-partner countries that score above the average. Among the OECD member countries, there were 13 countries that scored under the OECD average referring to percentage of students who agreed or strongly agreed with the statement “I feel happy at school”. Remarkably, nearly all of these countries (11 out of 13) showed scores above the average regarding scholar performance (mathematics, reading and science). The first group (Luxembourg, Australia, and the United States) had only very slightly difference with the OECD average of “80 per cent”. So tiny, in fact, that it is almost impossible to notice it by looking at Fig 2. In the second group, ranging from 70 to 79 per cent, we find Germany Italy, Greece, and Slovenia. Neither in this group is the difference high with regard to the OECD average. But then we have the third group, comprised by countries scoring in the segment of 60 to 69 per cent visualized in Fig. 1. These countries are Poland (69 %), Finland (68 %), Estonia (67 %), Slovak Republic (64 %), Czech Republic (63 %), and Korea (61 %). The remarkable fact is that these six countries scoring the lowest percentage of students agreeing with the statement “I feel happy at school” belong among the cohort of countries with highest scholar performance. And, “on top of it”, Korea, being the country with the highest scoring in scholar performance among all the OECD countries, it is at the same time scoring the lowest percentage of students being happy at school, among all the OECD countries. The main results in the PISA investigation are displayed in “Snapshot of performance in mathematics, reading and science”. 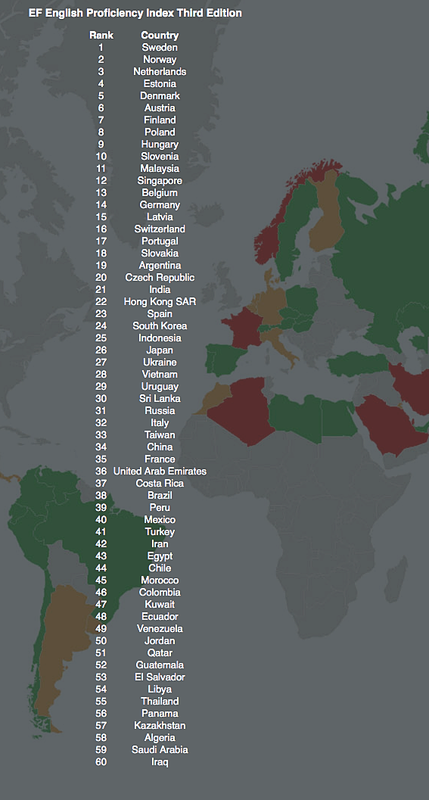 Here are all the countries ranked, including the OECD-partners nations. The countries scoring lowest in that table are Indonesia and Peru; Albania also in the lowest segment of performers. 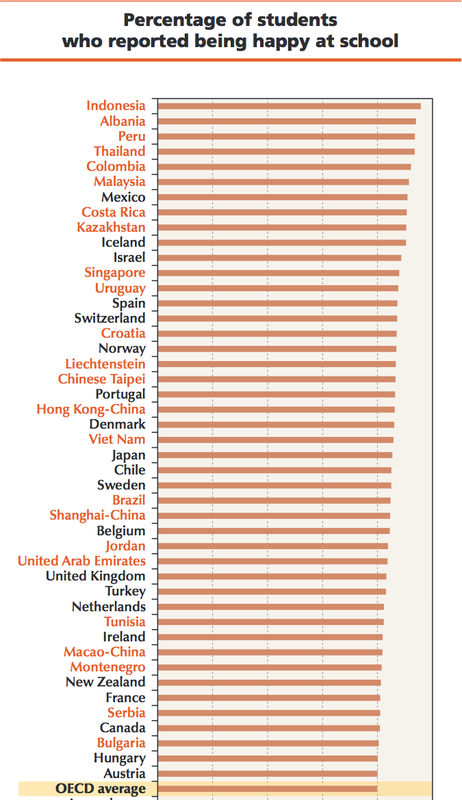 Now, rolling down to table “Percentage of students who reported being happy at school”, we find that Indonesia, Albania, and Perú, are the countries scoring with the highest percentages of “being happy at the school” among all the countries (Nr= 65). The OECD member countries are: Australia, Austria, Belgium, Canada, Chile, Czech Republic, Denmark, Estonia, Finland, France, Germany, Greece, Hungary, Iceland, Ireland, Israel, Italy, Japan, Korea, Luxembourg, Mexico, Netherlands, New Zealand, Norway, Poland, Portugal, Slovak Republic, Slovenia, Spain, Sweden, Switzerland, Turkey, United Kingdom (UK), United States (USA). Id. Page 21. Source: OECD, PISA 2012 Database; Figure III.1.2. I have sectioned the figure in two segments, above and below the 80 per cent average.